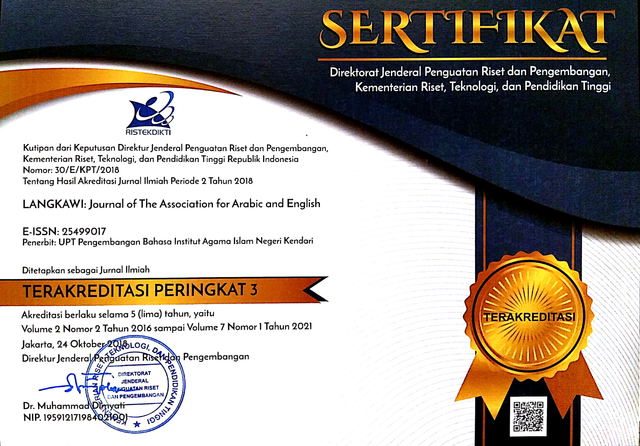 Since November 2018, the Langkawi Journal has been accredited by the Indonesian Ministry of Research and Technology through SINTA with S3 level. We would like to invite you and your colleague to submit your original research articles to Langkawi: Journal of The Association for Arabic and English. Langkawi Journal is peer-reviewed journal published biannually by UPT Pengembangan Bahasa IAIN Kendari. The journal puts emphasis on aspects related to Linguistic and Language Education. As its name, the Language use in this journal are English and Arabic.